Geological assessment for commercial ground source heat pump project. Sizing of heat pump units and ground-loop. Laying out of the borehole array. EDF Energy are considering installing renewable energy at their Russell Way site in Crawley West Sussex – a large 4 storey office that would eventually accommodate 400 individuals and had an initial estimated heating requirement of 200kW’s and 400kW’s of cooling load. The site had been vacant for some years, but was scheduled for reoccupation following a refurbishment programme. As part of the refurbishment, the heating system for the site was to be changed to a low carbon alternative. Following an internally commissioned investigation it was recommended that Ground Source Heat Pumps (GSHPs) should be considered to meet the heating requirement for the site, potentially supported by Air Source Heat Pumps as a secondary backup heating solution. 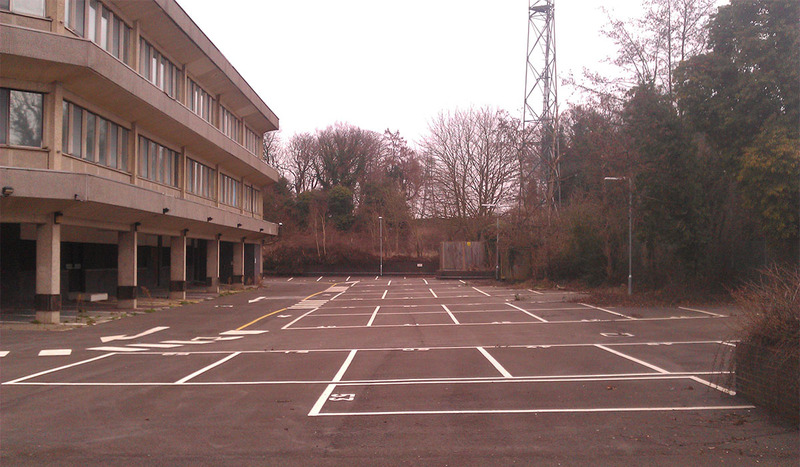 It was suggested that a patch of vacant ground on the margins of the car-park to the front of the building could be used for the borehole array for the GSHP. Prior to commencing any feasibility assessment we perform a due diligence check on the heating requirement figures that we receive. Our initial analysis revealed that for a building of this type and construction, a much larger heating and lower cooling requirement was required. We presented our findings to EDF’s M&E supplier and after reappraising their figures, they identified a peak heating load of 450kW and a peak cooling load of 350kW. Our next challenge concerned the proposed drilling area. Our initial assessment was that the patch of land in front of the car park was simply not large enough to accommodate the size of groundloop that would be required for this heating/cooling requirement, without thermal bridging occurring and the performance of the system being compromised. We understood that there was a reluctance to allow drilling in the car park area of the site, due to concerns about costs of reinstatement of the tarmac. We explained the drilling process and that the car park tarmac would not require to be re-laid as a result of our activities and obtained permission to consider the potential of using the whole car park area in the borehole array designs. Finally we looked at the geology for the site. It was noted that the site was located within close proximity of a major fault line (the Crawley Fault). It is important to understand the nature of geological faults, and the uncertainties which attend their mapped position at the surface. Faults are planes of movement (not necessarily vertical) along which adjacent blocks of rock strata have moved relative to each other. They commonly consist of zones, perhaps up to several tens of metres wide, containing several to many fractures. The portrayal of such faults as a single line on the geological map is therefore a generalisation. In addition to this, the geological observations on which the placement of this particular fault had been based were ambiguous and could be interpreted differently in the context of this location. Depending on which side of the fault a borehole was drilled, the geological sequence encountered may have differed considerably, as shown in the diagram opposite. The presence of the fault would have posed some complications to the final ground-loop length and borehole array layout, with a number of test boreholes being required to ascertain ground conditions for a final design. Based on anticipated ground conditions and the revised heating/cooling requirement, we undertook an initial design to ascertain the feasibility of the project. The estimated worst case ground-loop length was 8.26 kilometres. This translated as 60 No. 137.7m boreholes. Without optimisation of the heating/cooling requirement the full GSHP scenario was found to be unfeasible, due to insufficient space for the ground loop. Whilst a rationalisation of heating/cooling loads (kW) could have improved the situation, there was a finite amount of space on the site and the ground conditions are Low/Medium in terms of productive strata for ground source heat pumps. As much as we would have liked to see an all GSHP solution, our conclusion was that it was unpractical for this site. For the hybrid solution the cost of the plant and installation for the GSHP element of this solution would be in the ballpark region of £470K, with the ASHP plant costing an additional £80k estimate. Unfortunately this cost exceeded the planned budget. From our study EDF Energy were able to ascertain the feasibility of this type of project, in terms of impact on the building footprint of the required plant, the costs and how it would integrate with the other elements of their building refurbishment much earlier than they would normally have been able to and this saved the company both costs and time.